On Saturday September 15, 2018 bodyboarder Arthur Medici, 26, of Revere, Massachusetts, was attacked by a shark at Newcomb Hollow Beach at Cape Cod, according to the National Park Service. He was pulled out of the water and taken to Cape Cod Hospital, where he was pronounced dead, according to a story in the New York Times. 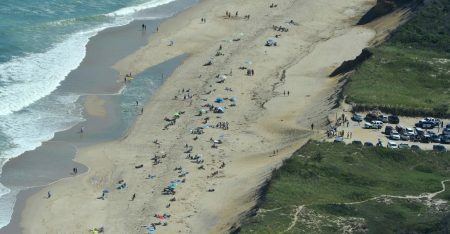 This is the first shark attack death in the area since 1936, however, it is the second attack in over a month, according to the story. The beach remains closed. A little reminder from Sister Pooh. 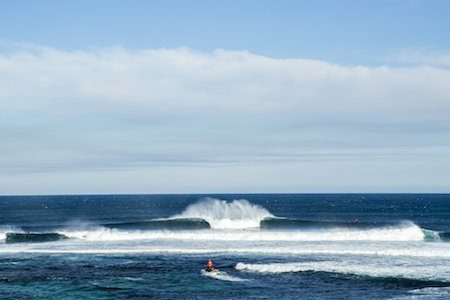 A certain privately owned entertainment company specializing in event and online streamed content production (mostly surfing sport) has reportedly shut down their production at Western Australia’s Margaret River due to sharks. Following two separate incidents that occurred at nearby Gracetown on Monday, April 16, approximately 6 kms away from primary competition site at Main Break, the [company] actioned safety protocols and met with a variety of stakeholders for feedback over the past 48 hours before making the decision to cancel the event. So, guess that’s one’s over. Seems this whole surfing content production business would be much more profitable if they’d simply shoot it TV style on a sound stage somewhere. They could shot a whole season in three weeks and then distribute it online over the year. If only there were a TV production facility that had perfect waves and no sharks. . . wait, doesn’t Kelly Slater have a ranch somewhere that could accommodate this kind of production schedule? Think of it — surfers would no longer have to travel the world all year. They could stay in one place, get their work done in one month, and then spend the rest of the year free surfing at home. People who wanted to watch them surf could travel to the ranch, buy tickets and watch. Kelly’s ranch could become the Branson, Missouri of surfing. If only. . .
A 29-year-old surfer was hit by a shark while surfing Indian Beach at Ecola State Park on the Oregon coast on Monday, October 10, 2016, according to story on Fox News. The animal bit 29-year-old Joseph Tanner on his upper and lower thigh, investigators said. Tanner had been surfing along Indian Beach at Ecola State Park at around 4 p.m. when the attack unfolded. . . He told emergency personnel that the shark was “medium-big” and thought it could’ve been a great white shark but said he wasn’t sure, according to KGW-TV. The shark pulled him off of his surfboard and he swam to shore, police said. Tanner, who works as a trauma nurse, was able to direct his own first aid with the help of others on the scene. He was stabilized and then flown to a Portland hospital with what were described as serious injuries. We haven’t really been on the shark attack beat so rigorously lately, because really, how many stories does anyone want to read about New Smyrna Beach, Florida. But Sunday, September 18, 2016 will go down as one of the sharkiests of days in shark bite city, according to the International Business Times (yeah, they’re chumming for link bait, too). In the space of five hours sharks attacked three surfers at a single Florida beach, while a teenage boy was bitten on a second beach. If you want the chomp-by-chomp coverage click the link. The good news is no one is dead. The bad news, is that Volusia County’s attacks this year are tracking up from last year. If you can believe it. In this new girl-out-of-water story Blake Lively stars as surfer girl Nancy who gets hit by a shark while surfing in paradise and then must struggle to survive. We’re guessing viewers will need similar skills just to sit through The Shallows, but who knows maybe it will surprise us. The film opens in North America on June 29, 2016. 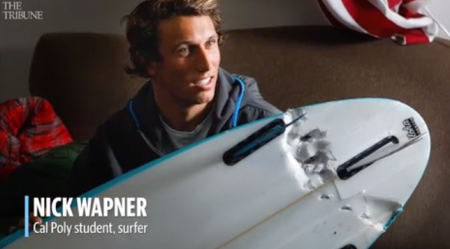 What is cooler than recording surfing on a GoPro using your “3d printed mouth mount”? Well, for SoCal surfer Drew Palumbo it’s catching footage of a great white shark blasting into the air just off Sunset Beach, California on April 18, 2016. I was out surfing with my friend Ben Slaybeck. After taking some drone footage of him, I put my GoPro onto my 3d printed mouthmount and went out to catch some waves for myself. Shortly after, I paddled out toward a wave, pressed record, and caught a great white shark breaching from about a 100ft away or so. They are out there and now we know for sure. We also know how grunty it sounds when you surf with a camera in your mouth. Thanks, Drew! It was every surfer’s biggest nightmare and over the past 12 hours it has become the leading news of the day. During the final of the J-Bay Open today (July 19, 2015) between Julian Wilson and Mick Fanning a shark swam over and tried to take a nip our of defending champion and three-time world champ Fanning. Fanning tried to yell to Julian Wilson for him to get out of the water, but Wilson was already on his way to help Fanning. Both surfers were immediately removed from the water by contest water patrol and neither had a scratch on them. The contest was halted and Fanning and Wilson were given equal second place finishes and split the prize money. We are so unbelievably overjoyed that it turned out the way it did and will be forever inspired by Julian Wilson’s heroic act. For the official word (and complete results) please follow the jump. 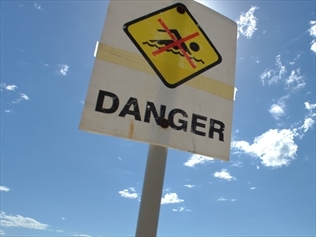 Christopher Blowes, 26-year-old surfer, was hit by a great white shark while surfing at Fishery Bay in South Australia’s Port Lincoln National Park on Saturday, April 25, 2015, according to a story on news.com.au. Witnesses described how the shark swam off with one of the surfer’s legs still attached to the surfboard’s leg rope. . . Mr Blowes was airlifted to the Royal Adelaide Hospital and a spokesman said Monday he remained in a critical condition in intensive care. . . In a statement released by the hospital, the surfer’s family said they were extremely grateful for the community support they had received. We wish him a solid recovery. For the rest of the story, click the link.